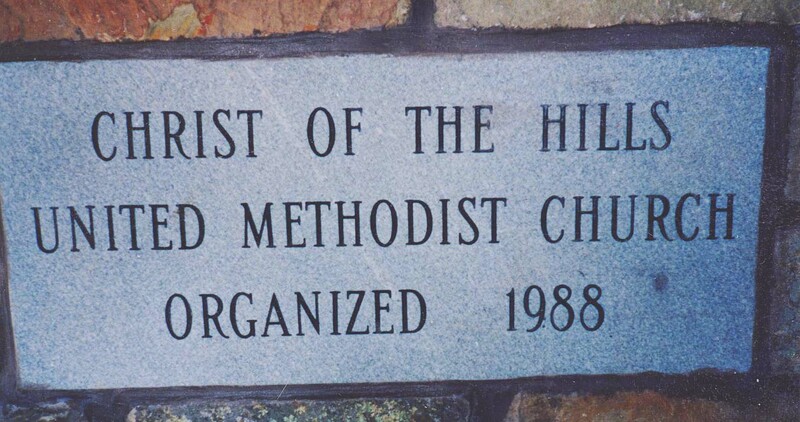 Christ of the Hills United Methodist Church was organized on January 3, 1988 with 43 charter members. In July of 1988, a building fund was established and on February 17, 1990, the new sanctuary was dedicated; membership had already grown to 200. Membership continued to grow and the year of 1992 ended with approximately 450 members. Senior Pastor, Chic Johnson retired and R. T. Jarrell was appointed to the church in June of 1992. In 1994, an addition housing a music room, fellowship hall, classrooms and offices was dedicated. A grand celebration was held for our 10th anniversary on October of 1998. In May of 2001, the third phase of our campus was dedicated adding approximately 6300 square feet which houses classrooms, music/lecture room, meeting rooms, a library and a music office. Rev. Jarrell retired and Rev. Bill Leslie was appointed to our church in June of 2001. 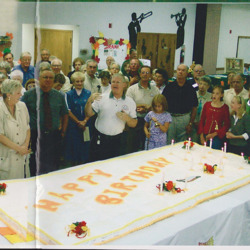 In June 2003, the church celebrated its 15th Anniversary with all committees and commissions having displays in the Fellowship Hall. The celebration was topped of with what was billed as the Village’s largest birthday cake ever, spanning over 7 feet in length. Rev. Leslie also introduced the "Dollar A Week" giving program during this time. The premise is that each time a person comes to worship they place a dollar bill in the collection plate in thanks to God for our blessings. These dollars are kept in a separate account. Charitable organizations fill out grants requesting funds for projects they may need and the Missions Committee reviews these projects. At the end of the year funds are awarded based on several criteria. Over the past 15 years Christ of the Hills has given back over $340,000 dollars to the Hot Springs and Hot Springs area through this program. In 2005, we expanded our Sanctuary to accommodate our growing membership which was approaching 1000. When the walls were torn down between the Narthex and the Sanctuary for the expansion, beautiful wooden archways were exposed. In 2006, Rev. Bill Leslie took an assignment with another church in Arkansas and Rev. Mike Morey joined us. Rev. Morey was our Senior Pastor until 2009; Rev. Dr. Walter Smith “Bubba” was appointed to our church as Senior Pastor when Rev. Morey was appointed as a District Superintendent. 2013 marked a year-long celebration of our 20th Anniversary. Many special events took during this year. Known as "Reflections: Looking Back While Looking Forward" we celebrated our roots, where we were presently and looking forward to our future. 2015 marked the completion of another building improvement project in the construction of a Welcome and Information Center. We have been blessed with caring and talented Senior Pastors and Associate Pastors over the years. Rev. Siegfried S. Johnson was appointed as our Senior Pastor in June of 2017 and Rev. Sheila Jones, and Rev. Regina Turner are our Associate Pastors. Kenny McKay is the Minister of Music and we are thankful for the beautiful music offered by Ruth Clemens, our organist and accompanist. As you can see, we have experienced changes throughout the years. Christ of the Hills UMC just gets better and better. Our membership continues to grow steadily and we are looking forward with anticipation. We welcome you to our church. If you have questions, please don’t hesitate to contact us by phone at 501-922-4503 or by e-mail at cohweb@cohumc.com.